Four volunteers are celebrating a combined total of 112 years of volunteering at Cats Protection’s Newtown & District Branch. Carol Evans has been volunteering for 31 years, Val Richards for 29, Lesley Taylor for 27 and Anne Puzey for 25. They have each been presented with a Murphy Award in recognition for their tireless support to the branch for over a quarter of a century. 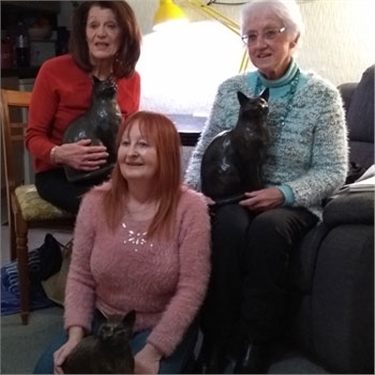 The Murphy Award is a large black cat statue, presented to volunteers who has worked for over 25 years at Cats Protection, or to those who have made an exceptional contribution to the charity. The Newtown & District branch covers Newtown, Welshpool, Llandidloes and surrounding districts. More information about the work of the branch can be found on their website.